We've launched a new experimental 'Events log' feature today which you will find in your LMS within a new section called 'Insights'. The events log is designed to provide you with a much clearer picture of what's going on with your account, events are grouped into broad categories such as 'users', 'results' and 'settings' and are presented in chronological order. You can scroll back through time and see events reaching back as far as a whole year ago! We hope you find this new experimental feature useful and look forward to hearing how you are using it. Please feel free to contact our support team if you have any questions. Placeholder image for Q1 2019 Product Development Update, story. Placeholder image for New registration and log-in options for training suite users, story. 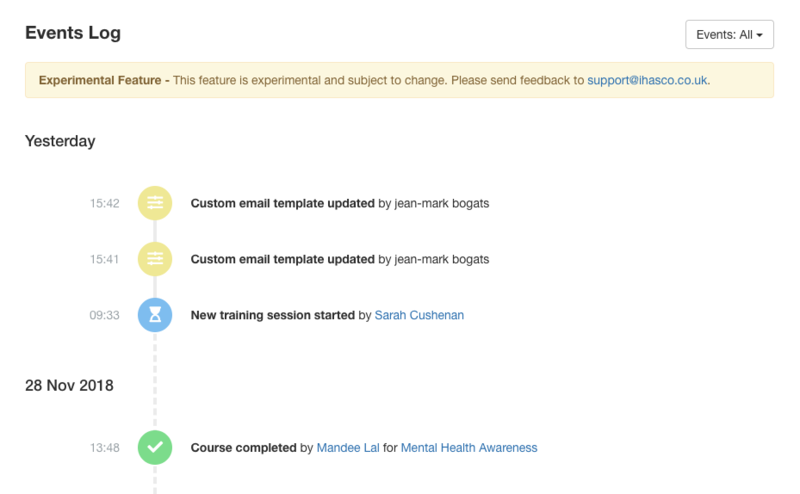 Placeholder image for Filtering individual user “results & courses” just got an upgrade, story.